This line is endlessly repeated by individuals and all over the web. Don’t believe it. Reverse osmosis is a fairly effective way to separate contaminants from the water you want to use. 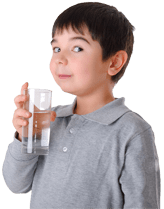 Membranes allow pure water through while holding back water with contaminants in it, like fluoride, chlorine and heavy metals. It seems clear to us that it is far better to use filter materials selected and fashioned to naturally remove the contaminants you don’t want, and leave the trace elements that you do. The technology has existed for decades and is very affordable for home unit.